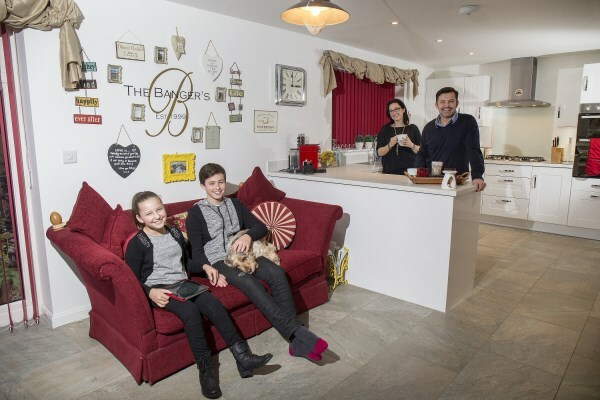 Accessibility was top of Stephanie and Nicky Banger's wish list when they began their search for a new family home - and a five-bedroom Bovis Home in North Baddesley ticked all the right boxes. Their 11-year-old daughter, Sophia, has cerebral palsy, which means the family needed a home that was wheelchair-friendly and that could be fitted with a stair lift to help their growing daughter get upstairs to bed. "We built our previous home from scratch, the year that Sophia was born," says Stephanie, who also has a 13-year-old son, Harvey. "Although we did everything we could to make it accessible, the way we'd built it meant that we just couldn't have the stair lift or through-floor lift we really needed." They made the decision to put their house on the market and on the recommendation of friends, they decided to go for a brand-new Bovis Home rather than the period properties they'd always been drawn to before. "We'd never looked at a new-build before but this was the perfect choice for us," says Stephanie. "There's level access, the doorways are wide enough for a wheelchair, the sockets are all at an accessible height and there's even one at the bottom of the stairs ready for the stair lift. "It's the location as well as the actual build. She's started to meet some neighbours and make friends, and she can access any of their homes in her wheelchair too because they are all built to the same specifications so she can just pop round to see them. She couldn't do that before and it's fantastic for her to feel more independent." And there are other aspects to the design that give the family the space and flexibility of accommodation they need. "The second bedroom has an en suite, which means we can use it for respite, and in the smallest bedroom, we've got the majority of Sophia's equipment and I've converted it into a physio room. Having the extra room upstairs is fantastic for our particular needs. "With Sophia's disability, the way the house is laid out it just perfect. Everything leads off the central hallway so no room is isolated. It's a very sociable and friendly layout. Everyone who comes round says the same." 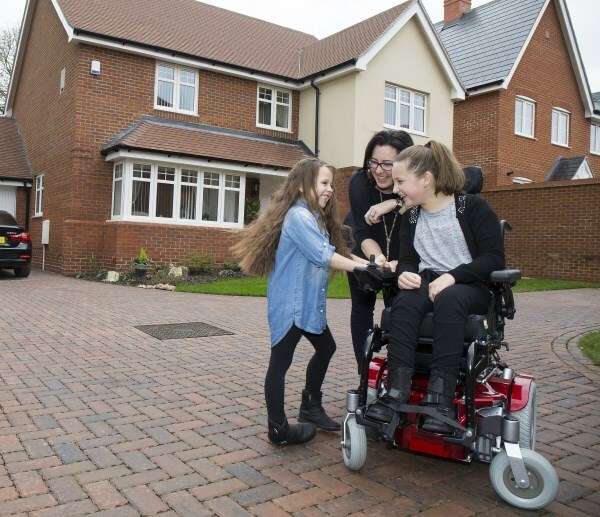 The couple used Bovis Homes' Smooth Move package, and saving on the estate agent's fees has meant they have the necessary funds available to widen paths and install a ramp in the garden so Sophia will be able to play outside more easily. 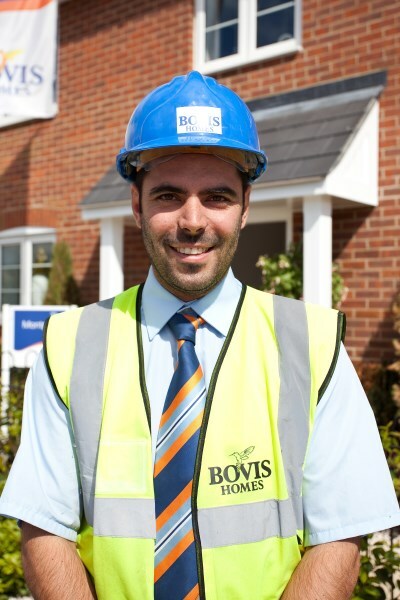 They are especially grateful to Bovis Homes Site Manager Ben Virabi, who went out of his way to make sure that the property was as wheelchair-friendly as possible for Sophia. "Ben has been absolutely brilliant, he really has," says Stephanie. "The front path was supposed to go down at an angle to the house but he's put it straight down to the driveway from the front door to make it more accessible for Sophia. He also altered the pathway round the side of the house to make sure it was easier to get a wheelchair on it from the driveway." Nicky and Stephanie are so taken with their new Bovis Home that they are now completely converted to new-build properties. "We haven't looked back," says Stephanie. "When it comes to a time when the children perhaps leave home, we'll probably look for another new-build. We are completely over the moon with everything and we are really happy here."